You won't believe how easy Cunifer™ brake line is to work with. The 007 Flaring Tool is the easiest and most reliable flaring tool you'll ever use. Combine these with our brake line fittings and technical assistance and you have everything you need to tame that nightmare. 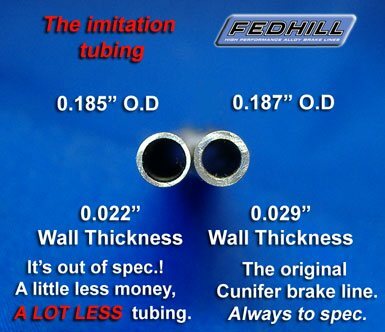 FedHill is the exclusive importer for Cunifer™ brake line products. Cunifer™ is a seamless, copper-nickel alloy DOT approved brake line that is as strong as steel, completely corrosion proof and is easier to work with than any other brake lines on the market. It is easy to bend, which allows it to be snaked into positions that conventional brake lines cannot. Cunifer™ also flares easier, seals better and requires less prepartion than any other tubing on the market. It does not rust, so it is perfect for any environment. No other brake tubing compares for strength, reliability and ease of installation! We have been providing the finest quality brake line products available to both manufacturers and individuals since 1995. Since then, the marketplace has been flooded with cheaper imitations. 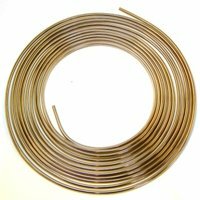 Major U.S. corporations are making claims stating that their copper/nickel tubing meets the SAE specification J1640 for copper/nickel tubing. Customers calling with problems using the imitation tubing alerted us to investigate the competition. If you’ve been looking at the lower priced competition, please take the time to consider why our tubing is more expensive and how that benefits you. We purchased samples to find out what the problem was and found that the competitions claims are as flimsy as their tubing. The bare minimum specification for wall thickness is .025”, the middle of the spec. is .028” with a max of .031” Our samples of their tubing measured at .022”, and some customers have reported a wall thickness of only .019”! The .003” variance between the .019” and .022” samples was surprising, and the fact that it is nowhere near specification is alarming. Working directly with manufactures for all these years, it’s no secret to us the problems with making and assembling pressure conductors (brake lines), and the burden our product bears. Even when every component IS in spec., there are 1 out of a thousand joints that fail everyday on the assembly line, and the industry is working hard to improve on that. Please read this white paper from the SAE to learn why. Click here to view the SAE white paper. It doesn't cost that much more for the very best. More metal in your brake tube and more security for those who want the best. This causes fewer problems and less headaches with your installation. This is how the best of the U.S. Corporate competition measures up, and then there’s the tubing made in Mexico, China and India that’s flooding the marketplace. It is the perfect replacement brake line tubing for cars, trucks and buses. Snow plow operators know that replacement steel brake lines rust out faster than the OEM brake lines. Two years later you're replacing the brake lines again. Cunifer™ brake lines do not rust! Ever! Using its fast cam and lever action, you can press a perfect double flare in 30 seconds and quickly change flare sizes if you need to. Its precision made punch and smooth bore die blocks grip and form the flare without damaging the tubing. With this tool, you can make aircraft quality flares for SAE 45 degree double (inverted) on American or metric sized tubing, DIN flares on metric tubing, and British bubble flares. We have purchased and tested almost every brake line flaring tool on the market and this is the finest, most reliable tool we have found. 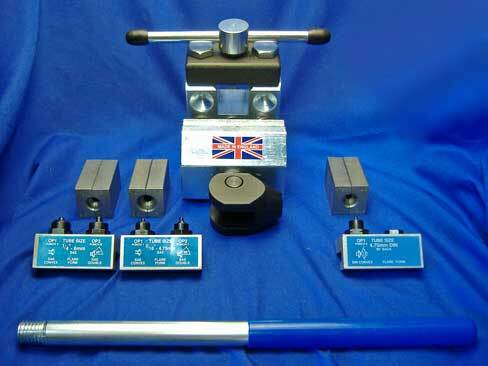 Our shop has been personally using this tool for 20 years, and we are quite proud to now represent the manufacturer and have the honor of supplying this tool to you. You need the fittings to complete the job. 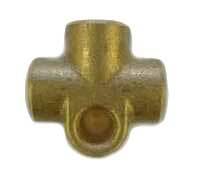 We stock a wide assortment of brake line fittings. From vintage Ferrari to modern metric, British Whitworth threads, and a multitude of SAE/American brake line nuts including master cylinder nuts. We also carry tee's, unions, bleeders and adaptors for brake line locks, brake proportioning valves and AN hydraulic brake tubing nuts. Last but not least, if you have any questions or need technical help, please read through our technical help page. Replacing brake lines on a modern vehicle really is a nightmare. You have our sympathy and support in sorting out the mess! If our web resources don't answer your questions or you have a "you can't get there from here" situation with your plumbing, please feel free to contact us. Satisfaction guaranteed. Please see our return policy.